New Year, New Living Room! In most single family homes and townhouses today, the living room is often known as a supplemental living space that always finishes second behind the family room. If you think about it, there are reasons for this attitude that make a lot of sense. First off, family rooms are usually cozier, everyday spaces while living rooms are more formally dressed. Likewise, most family rooms boast television sets and entertainment centers while the living room is a quiet, peaceful room sans media equipment. Historically, living rooms have been spaces used for face-to-face conversation for guests and visitors, but with modern technology and communication systems, in-person visits have become less frequent and living rooms have lost their sense of purpose that was so important just a few years ago. Today, more often than not, people walk by or through their living rooms to get to the heart of the home – the kitchen and family room, and/or den (aka “The Great Room”). It seems like living rooms are frequently glanced at or walked through but are rarely given the attention they deserve. Given this trend, perhaps it is time to reconsider the traditional living room. I thought it would make an interesting blog to think about how living rooms can be used in non-traditional ways that revitalizes them into gathering spaces for family and friends rather than unused square footage. Hence, this post explores the living room in a few non-traditional ways, including… living room as an art gallery, library, game room, music room, play room, fantasy room (where you take design risks you’ve always wanted to put in your house somewhere – with color, funky art, glitzy glamour, etc. and design it all in a cohesive way), and/or some combination of the above! Living Room as an Art Showroom: To properly display art in a way that makes a room feel gallery-esque, lighting must be addressed. An investment in recessed or track lighting that sheds light on the walls and creates solid overhead lighting is all it would take to create a room that is devoted primarily to what is on the walls. Maybe you are an art collector, an artist or just enjoy what your daughter/son made in art class. 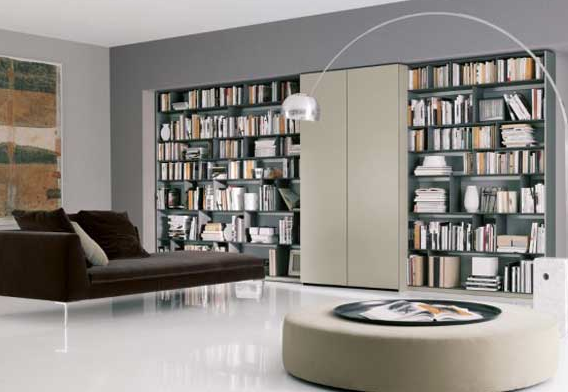 Whatever the case, living rooms can be used as a spectacular space to show off your art collection. This twist on a living room can be easily combined with other ideas to make the room a creative space for the whole family! 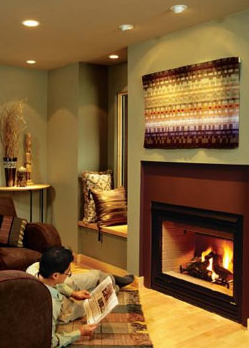 Recessed lighting can be installed to highlight art from above, which table and floor lamps fail to do. While some people may think that an ‘art gallery’ vibe may be cold and even more formal, this look can definitely be pulled off with a casual flair. Remember, this is your own home, which means that you don’t have to have the white gallery walls, and you are your own curator. Another way to highlight art in a space without upgrading the lighting scheme is to install an inexpensive picture rail or track system that makes it easy to hang multiple pieces of artwork. Here is an example of a stainless steel picture rail where all the art is hung at the same level and is about the same size. This picture rail definitely emphasizes the art and is often seen in galleries; hence, it would make a good addition to a living room with an artzy theme. 2. Living Room as a Personal Library: Living rooms can be converted into great library and reading spaces. Since living rooms are usually more quiet than family rooms anyway, why not highlight this idea by making your living room into a great reading area? Check out some of these innovative and fun ways to display your book collection! A personal library for adults and children, with youthful colors and a fun ladder but enough sophistication to make this room great for all ages. 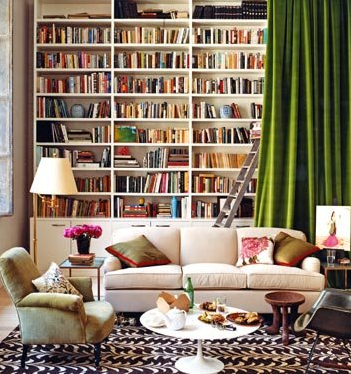 A pretty living room/library combination! 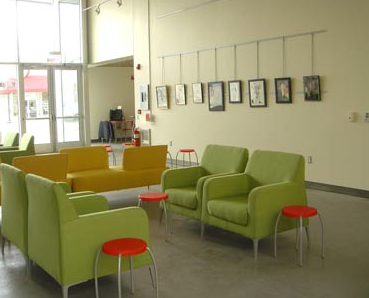 This cool, modern library has a great oversize chaise and ottoman, large-scale artwork and clean lines. 3. Living Room as a Game Room: These days the connotation of ‘game room’ makes many people think of finished basements complete with pool/poker table, auxiliary kitchen and projection-sized TV used for hanging out. In terms of living rooms used as ‘game rooms’, I’m thinking old school. A small table with comfy chairs may be just the arrangement for other smaller-scale games such as board games, puzzles or playing cards. 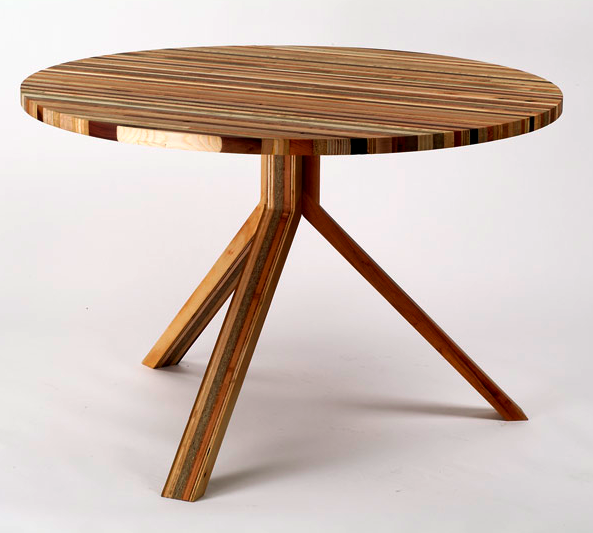 This cool table is actually made of wood scraps by Scapile. It is the right size that leaves room for other elements in a room like a sofa. 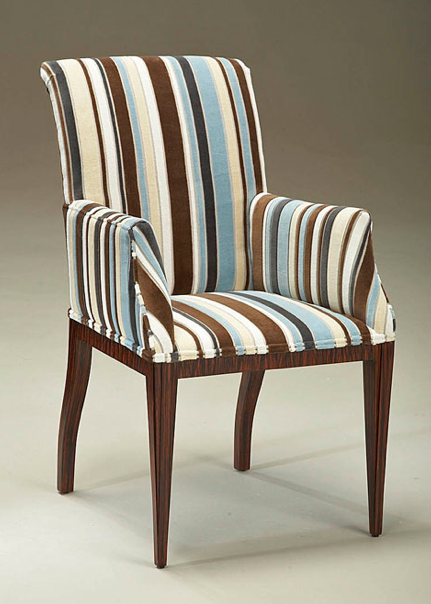 A few comfortable chairs like this one from Julian Chichester make a pleasant seating area for playing games. Here is a nice corner table that is perfect for playing cards. 4. Living Room as a Lounge or Fantasy Room: Living rooms can maintain their old function as formal areas for guests in a new way by adding a lounge vibe to a seating area. They can also be turned into a ‘fantasy room’ of sorts. By this I mean, use some design ideas you have always wanted to try but just never got around to – unique, beautiful window treatments, a different color palette, funky furniture, etc. Here’s one design idea — go bold with color! This living room definitely strays from a typical color palette with bright whites and various shades of pink, but all the other elements of a normal living room exist (conversation area, fire place, etc). 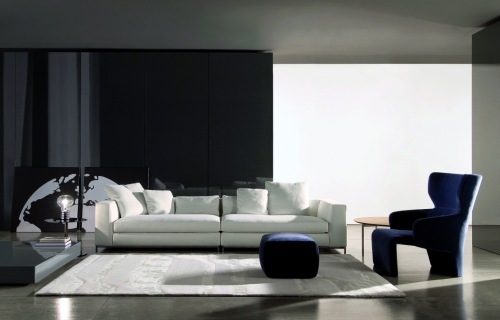 Achieve a lounge feel with a low sofa and a minimalist design. 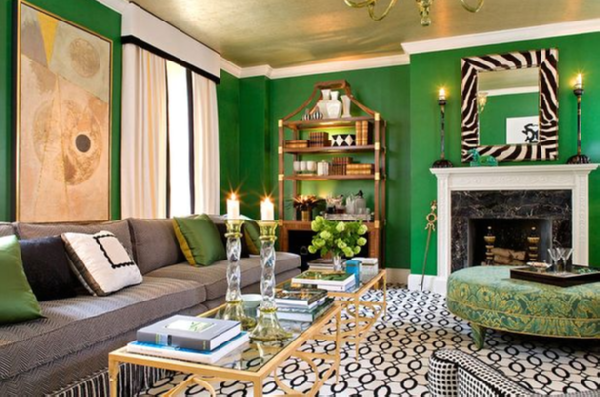 Here is another example of a living room that uses a bold color! 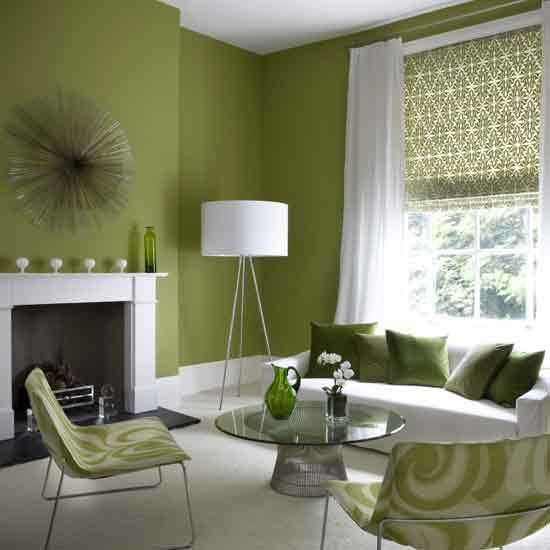 I like the combination of modern furniture with the green and white color palette. Check out this living room. I love the volume of the drapes and the high back sitting chairs. Go bold with color with a rich chocolate brown. 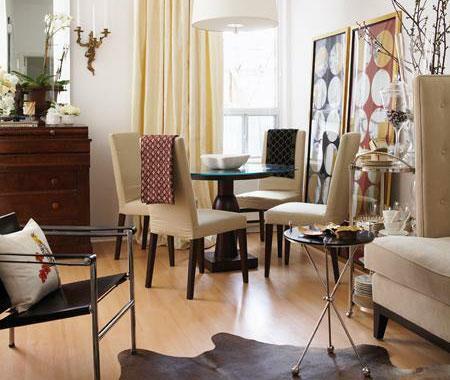 Remember, all of these alternative living room ideas can be mixed and matched! Make your living room more than just a pretty room to look at. Add some pizazz, modern functionality and most importantly, creativity to start using your living room again! ← Ring in the New Year with the Hottest 2011 Decorating Trends! We like your blog and would like to receive your brochure or publication on your next big ideas. Kindly send over by e-mail or facsimile at (+62-21) 7204723. Thank you. I love dreamdesignlive.com! Here I always find a lot of helpful information for myself. Thanks you for your work. Thanks! I am glad you find our posts useful. If there is a topic you would like to learn more about, please post your ideas here and we will see what we can do!